44 pages. 32 color reproductions. Hardcover with dust jacket. Published on the occasion of the exhibition Arenas. 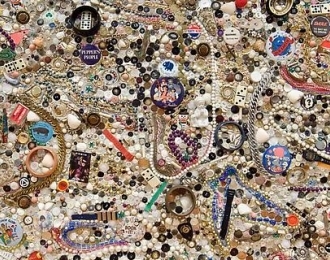 The exhibition is comprised of seven out of the eleven works from this series, all of which were originally exhibited at Metro Pictures Gallery in 1990. 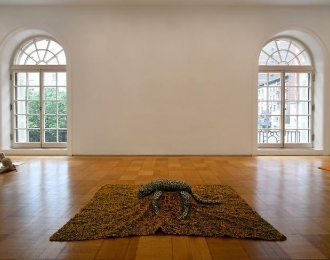 In this series of sculptures, found handmade and machine fabricated afghans and blankets are flanked with stuffed animals and displayed on the floor. Each sculpture, all of varying sizes, contains one specific motif and focuses on the assembly of stuffed animals in an “arena” for anthropomorphic observation. They are played with, slobbered on, soiled, tossed around and thrown on the ground. Displaying these sculptures on the floor actively obliterates the concept of pristine museum or gallery objects.